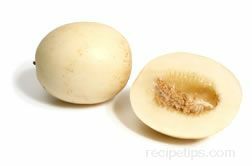 A round melon, very similar to a cantaloupe, but larger in size. 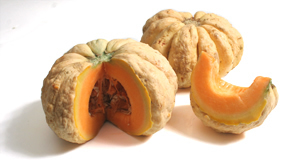 The outer skin is netted in appearance and covers a pale orange flesh that provides a very sweet flavor. To check for ripeness, depress the blossom end of the melon, opposite the stem end, to make sure it is not hard and yields slightly when depressed. And, the weight of this melon will vary as it ripens, becoming lighter as it matures.